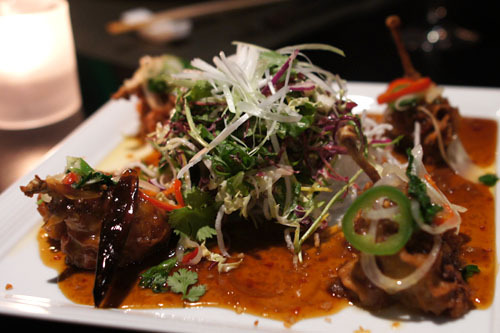 Though Wolfgang Puck did not by himself create the Asian fusion genre, you can't argue that he helped popularize and legitimatize the cuisine with his seminal Cal-Asian eatery Chinois on Main, which he opened with then wife Barbara Lazaroff in 1983. Since then, Puck has debuted a countless number of places, but WP24, on the 24th floor of the new Ritz-Carlton at LA Live, represents his first full service Asian restaurant since the ill-fated ObaChine chain of the late 1990s. Though the contemporary Chinese-influenced menu at WP24 was developed by Puck and Lee Hefter (Puck's Corporate Executive Chef), daily execution of the line is the task of Chef de Cuisine David McIntyre. A native Angeleno, McIntyre was a student at the University of Washington (studying business and psychology) when he first fell in love with cooking. His parents were early investors in Joachim Splichal's newly four-starred Patina, and through this connection, he was able to stage there. The Chef did return to U-Dub to finish his degree, graduating in 1997, after which he worked at Patina for a year before embarking on a culinary tour of Europe. Upon his return, McIntyre next move was to Puck's flagship Spago in 1999, where he worked his way up to the position of Sous Chef and eventually Kitchen Manager. He would stay at Spago until early 2006, and later consulted on the opening of Puck's steakhouse CUT at the Regent Beverly Wilshire. McIntyre, naturally, wanted his own place, and thus, he moved to San Diego to open up his Cal-Modern eatery Crescent Heights (named after the Los Angeles thoroughfare) with wife Mariah. 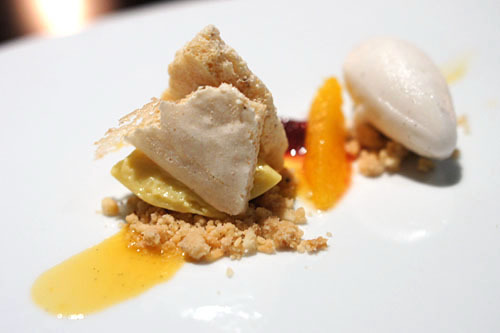 The restaurant, sadly, lasted nary a year before shuttering in June 2009, and following, the Chef was lured back to LA by his old mentor Puck and the promise of an Executive Chef position at the gleaming new WP24; McIntyre started here in January. This dinner was instigated by longtime kevinEats reader Collier (who plans to open his own restaurant in the coming year), and joining me were several of his friends, as well as Christina of Food Je T'aime and Ryan of Epicuryan. The restaurant takes up most of the 24th floor, with the bulk of that space dedicated to a wraparound lounge with panoramic views of Downtown. We, however, were located in the surprisingly small, surprisingly dark main dining room, whose views are not quite as breathtaking, but nevertheless still impressive. Specifically, our party of eight was seated in one of two private dining rooms. Taking a look at the menu, it's clear that the kitchen is drawing inspiration mainly from the Chinese repertoire, with only occasional dalliances outside the country. We all went for the 9 Course Tasting Menu option, priced at $125 (add $70 for wine), though clearly, we received well in excess of the specified number of courses. 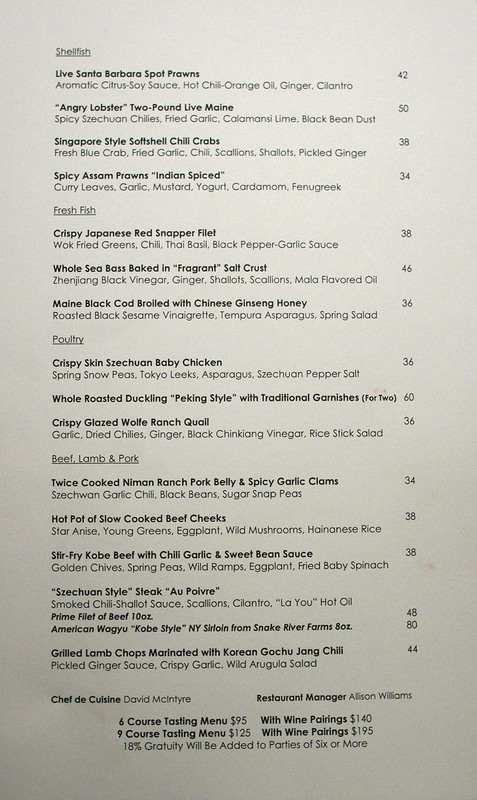 Meanwhile, a simplified version of the menu, along with sushi (yes, you can get California Rolls if you must), is available in the lounge. Click for larger versions. We were told that each table receives a complementary plate of prawn toast to begin, and indeed, this was a very gratifying way to kick off the evening. Eaten alone, the toast succinctly presented the essence of shrimp, but the included sauce added a sweet-hot relish to things that really completed the amuse for me. 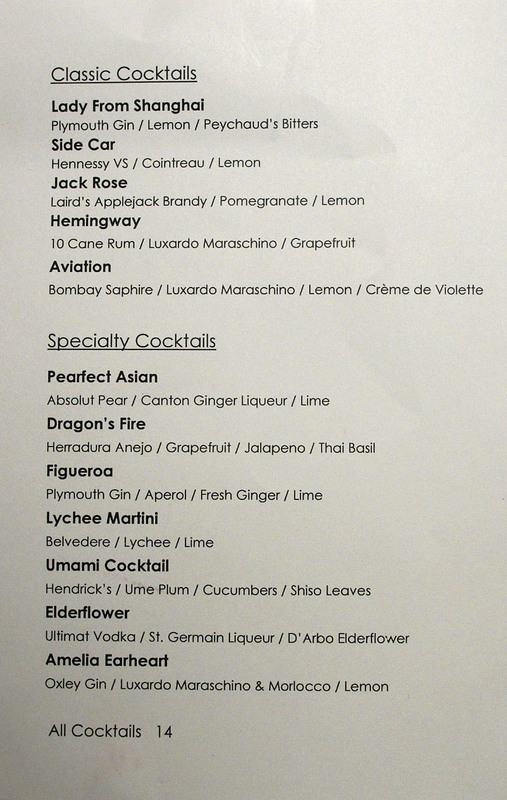 Cocktails are uniformly priced at $14 each, and we chose a trio to start. 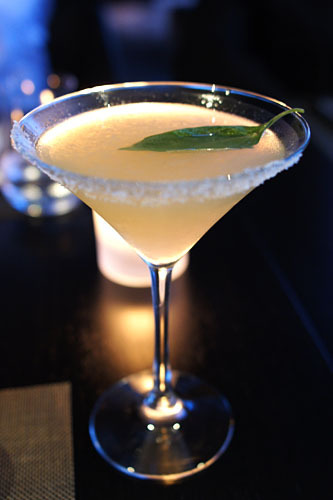 I had the Dragon's Fire; made with Herradura Anejo, Grapefruit, Jalapeno, and Thai Basil, it demonstrated a pleasantly tingling, lingering heat with a hint of astringency from the basil. 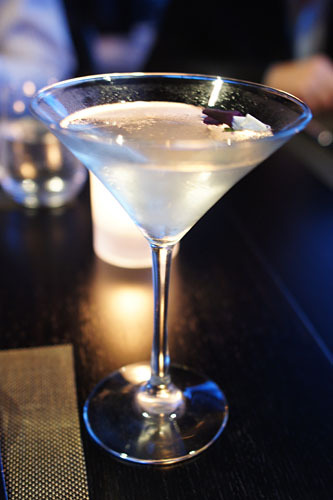 The Elderflower (Ultimat Vodka, St. Germain Liqueur, D'Arbo Elderflower), on the other hand, was strongly sweet and floral in nature, while the Umami Cocktail (Hendrick's, Ume Plum, Cucumbers, Shiso Leaves) showed off a complex saccharine-salty interplay backed by a piquant finish. 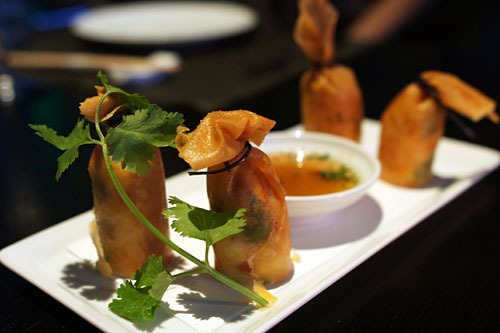 WP24's spring rolls are subtly sweet, monolithic half-cylinders of dense, spongy, shrimp-y goodness, wrapped up and tied off with sheaths of delightfully crisp wrapping paper. 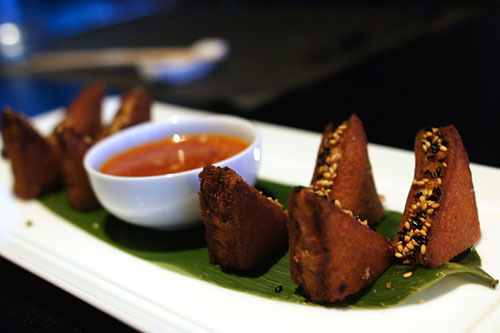 Tasty enough on their own, the rolls were deftly augmented by the paired 10-Spice dip (like a super-duper five-spice? 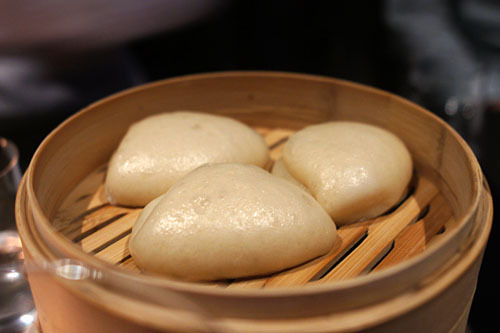 ), the sweetness of which nicely emphasized the crustaceans' natural savor. A simple, but satisfying dish. Wagyu beef in puff pastry? It's hard to go wrong with that combination. 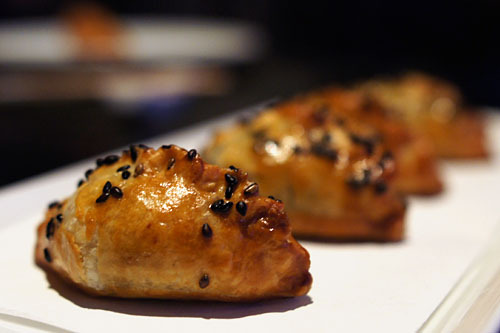 This Chinese-inspired "empanada" was stuffed with softly spicy, richly flavored, immensely succulent beef that was superbly subdued by its crisp, flaky crust. I could've eaten an entire plate. 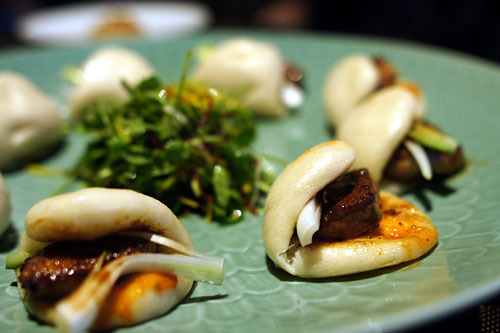 These Momofuku-esque buns were a bit of a surprise. Wolfgang Puck has famously spoken out against the use of foie gras, and refuses to serve the product at his restaurants. Well, what we have here looks like foie gras, smells like foie gras, and tastes like foie gras, but apparently, it's just plain old duck liver (no gavage necessary). 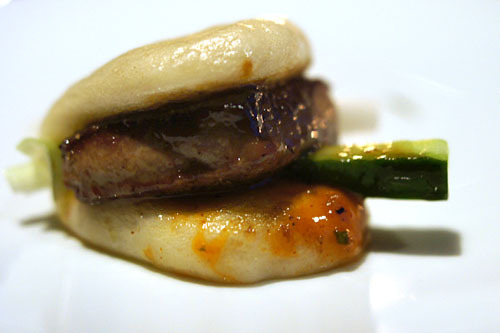 It was also mahhh-velous, one of the best preparations of hot foie gras--I mean, duck liver--that I've had in a while. 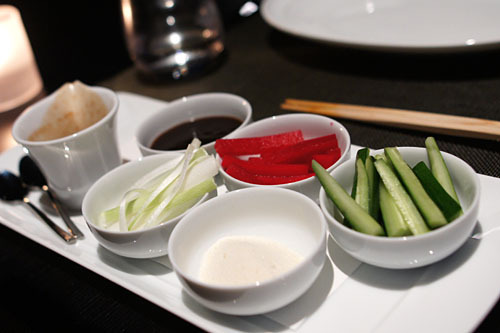 The sweetness from the bean paste was just powerful enough, and I loved how the liver's potency was so effectively countered by the zesty scallion and cucumber. Next up was a Sichuan-ish dish, in the same vein as hot and sour wontons. 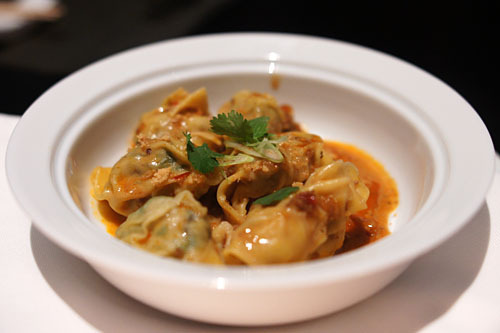 The pleasingly piquant, pungent chili-garlic dressing did a great job in perking up the otherwise tame dumplings, while the use of green onions added a great vegetal smack to the dish. The peanuts were a nice touch as well. 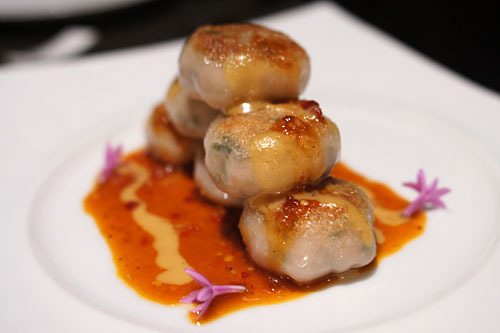 One of my favorites bites of the meal came courtesy of these dumplings. 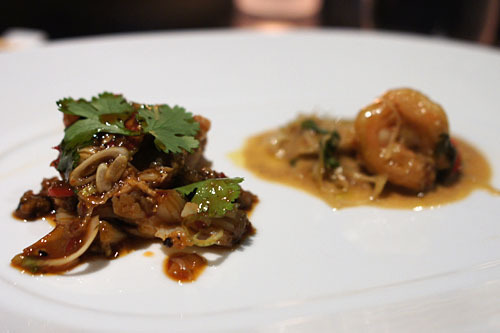 The amalgam of crab, shrimp, and pork resulted in a delectable mishmash of savory flavors that went perfectly with the soft astringency of chive. What was arguably better, though, was the dumplings' flawless wrapper, a fantastic combination of soft chewiness and pan-fried firmness. The mustard, meanwhile, contributed an impeccable heat to complete the dish. 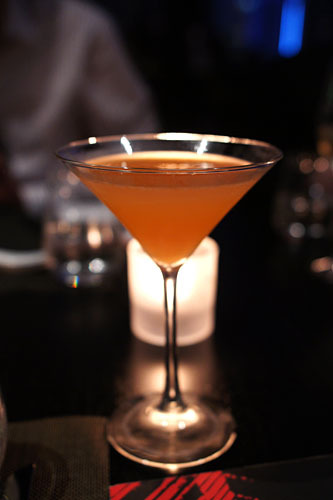 With our previous cocktails downed, I ordered up a Figueroa, made with Plymouth Gin, Aperol, Fresh Ginger, and Lime. I rather liked this one, with its sweet, herbaceous, floral character that deftly tempered the power of the gin. 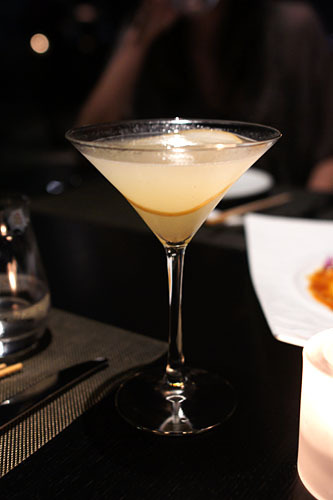 I also tried the Pearfect Asian, composed of Absolut Pear, Canton Ginger Liqueur, and Lime. 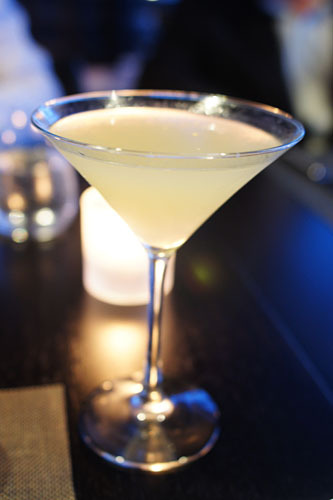 This was a suitably saccharine, gritty, "girly" drink that really conveyed the essence of pear. The next course was a bit of a mess to look at, but fortunately, it tasted much better than it looked. The bird had a sort of "sweet & sour" type citrus-y glaze, which imparted a fitting sugariness on the otherwise savory, succulent flesh, but the best part of this dish was its soft, subtle spiciness that really creeps up on you. I also enjoyed the great crunch of the quail's skin, as well as how the paired salad moderated the heft of the meat. "Like eating Indian food." Indeed. Here, the kitchen takes a departure from China and lands squarely in India. I enjoyed the interaction between the prawns' natural sapor and the sweet-spicy essence of the crustaceans' aromatic, heady, curried accoutrement. 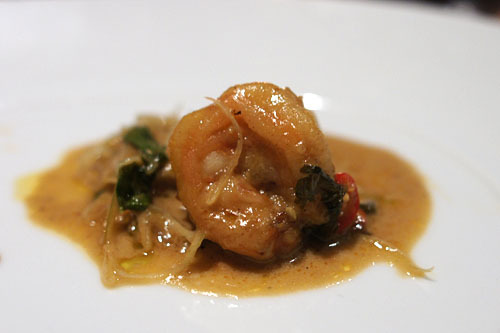 The use of coriander, meanwhile, gave the prawns a strong vegetal close. I actually quite liked the dish, but unfortunately, it got a bit cold since it was paired with the next course. It was a poor decision to plate this and the prawns together, as both dishes were compromised. In addition, the lobster was not presented to the table prior to plating (as the prawns were), another service faux pas. In any case, this was a wok'd presentation of lobster, one imbued with the familiar, hefty Chinese flavors of chili and black bean, perked up a notch by the calamondin. It was tasty enough, but some at the table felt--rightfully so--that the inherent nature of lobster was lost in the dish. 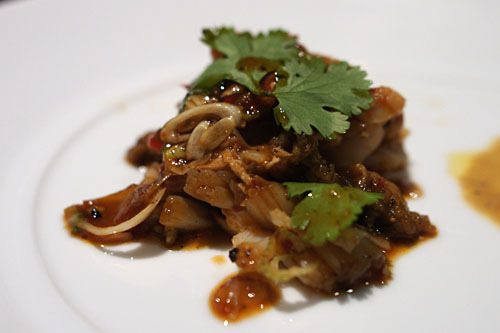 When I was young, I remember thinking that XO sauce was actually made from XO cognac (from which its name derives). Though cognac, especially of the XO variety, is a popular libation in many parts of China, the sauce is actually merely an amalgam of dried seafood and various spices. That being said, here, it contributed a touch of ocean-y flair that nicely complemented the lobster, the inherent flavor of which was nicely preserved in the dish. 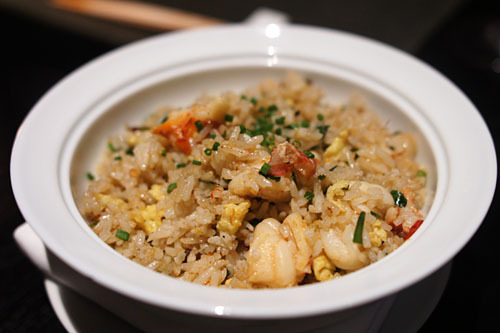 Overall, a delicious presentation of fried rice. At this point, we come to the pièce de résistance. An entire roast duck was ushered out to our table to whet our palates, then brought back to the kitchen for slicing. We were subsequently presented with plates of the bird's dark, delectable skin and flesh. 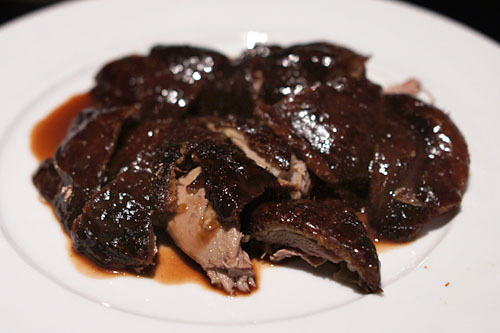 The meat was actually too heavy, too intense--it took on an almost foie gras-like richness--to eat alone. But pair the duck with the included accompaniments of hoisin, sugar, radish, cucumber, scallion, and steamed bun, and now you're on to something! The vegetables, in concert with the buns, did a perfect job in countervailing the sweet heft of the meat, resulting in stunningly balanced, simply stupendous bites. 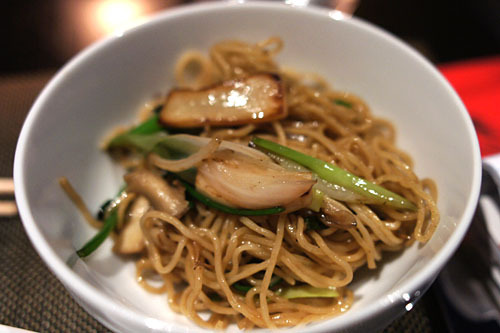 To go along with the duck, we were provided bowls of Hong Kong-style noodles. They were a bit too oily for me, and thus made for a rather heavy dish. I did, however, enjoy the complementary flavors of mushroom and chive. 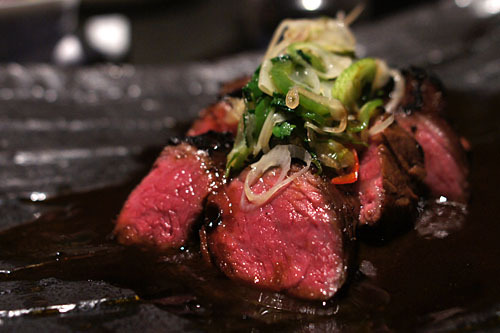 Chinese food isn't known for its use of high-quality cuts of beef, but the American wagyu here was every bit as stellar as the steaks Puck serves at CUT. This Sino-ized steak au poivre was incredulously tender--mastication was barely necessary--with a great bit of lingering, peppery spice that was beautifully tempered by the scallions and cilantro. A table favorite, with good reason. 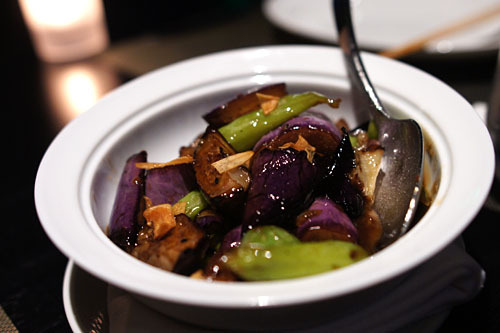 Given that I'm not a huge fan of eggplant in general, I wasn't terribly keen on this dish, which was meant to accompany the steak. The aubergines themselves were melt-in-your-mouth tender, but I much preferred the shishitos and garlic. Desserts at Chinese restaurants usually aren't much to speak of--ice cream, jello, sliced oranges--but obviously Puck wants none of that here. The sweet stuff definitely draws more from Western culinary traditions, and are the purview of Pastry Chef Sally Camacho. Click for a larger version. About Sally Camacho: Camacho began her kitchen career at San Francisco's California Culinary Academy. After externing at the Caneel Bay resort in St. John, she return to the CCA and completed her degree in baking and pastry arts in 2000. The Chef then took a job at the Four Seasons Beverly Hills under Executive Pastry Chef Donald Wressell; her five years here formed the basis of her practical training. 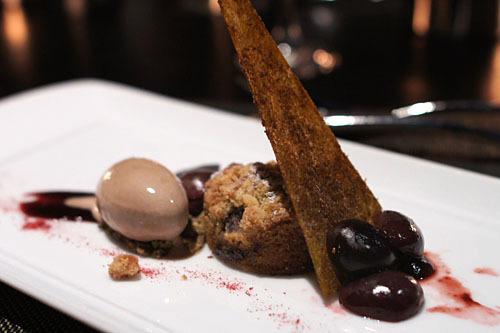 Then, in 2005, Camacho relocated to Las Vegas to assist Executive Pastry Chef Frédéric Robert in opening the Wynn. Her next move was down the Strip to Caesars Palace, where she took on a Pastry Chef position at Bradley Ogden. While there, she met fellow pastry chefs Jin Caldwell and Kristina Karlicki, and the trio wound up competing in the 2007 National Pastry Team Championship, taking home the silver medal. Camacho then moved to Florida, first becoming Executive Pastry Chef at the Fairmont Turnberry Isle Resort & Club in Miami, then consulting and teaching at the Ewald Notter School of Confectionery Arts in Orlando. She eventually moved back to California in 2009, however, and took on a Pastry Chef role at AK before joining Puck's team at WP24. 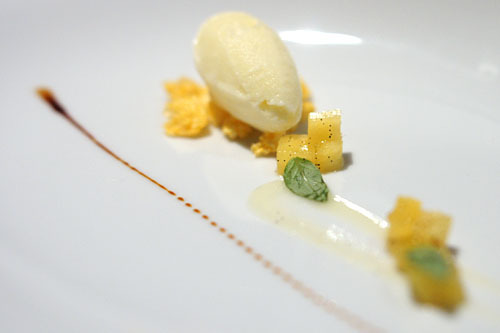 Serving as a bit of a palate cleanser, we had here a relatively subtle pineapple sorbet, heightened by bits of tartish cubed pineapple and crisp flakes of dehydrated orange. The key here was the interaction between the sweet, luscious lychee-vanilla sorbet and the tartness of the calamansi, all bounded by a bit of spiciness courtesy of the star anise crumble. I appreciated the inclusion of suprêmes of blood and regular oranges as well. Some of my dining companions took issue with the texture of the meringue, though personally, I didn't have a problem with it. We closed with a lovely pistachio-brown butter cream cake, which had a delightful undertone of saltiness that played off the dark, jammy sweetness of the cherries and luscious creaminess of the chocolate quite nicely. 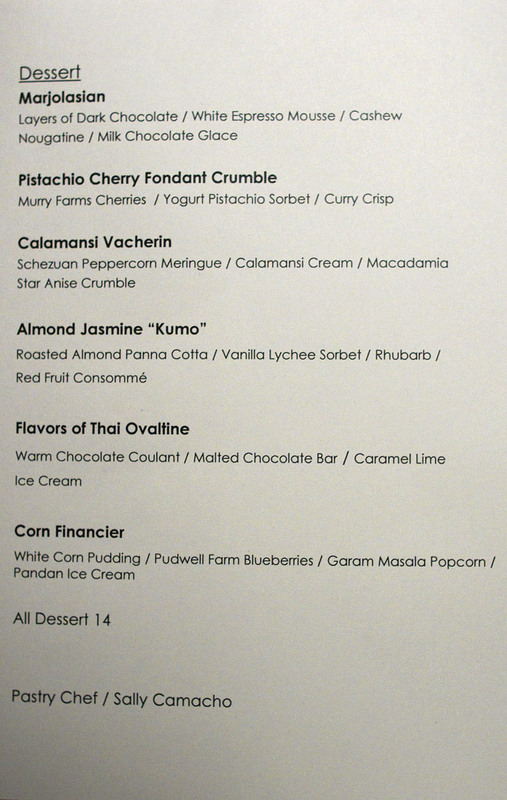 I wasn't so sure about the so-called curry crisp though, finding the vadouvan-scented tuile rather jarring. A note about the parking situation: Heinous, in a word. I was charged an unconscionable $35 for valet parking at the JW Marriott, the entrance of which is on the south side of Olympic. You can also park at the Ritz by turning in on Georgia (the two properties are internally connected), but the cost is identical. I'm no stranger to valet parking, but I can safely say that I've never been charged more for it in all my years of dining out (and people thought the $14 at XIV was bad). There was no posted pricing either, so I was left with a rather bad taste in my mouth at the end of the evening. I'd look into parking at LA Live to avoid the plunder. A restaurant like WP24 has the potential to turn out horribly, horribly wrong, but fortunately, I was quite pleased with my experience here (discounting the parking debacle). I think that the place is much more than merely a "Chinois on Olympic." It seems like WP24's a step up in terms of finesse and execution, and I'd wager that it's more traditionally Chinese as well--which brings up a good point. The food here didn't strike me as all that "fusion-y," so to speak; for the most part, it seemed strongly based in classic Chinese cookery, but with a few twists here and there--Puck does Chinese, in effect. That's not a bad thing, mind you, as I found the food here superior to that at many "authentic" Chinese restaurants. WP24 may be gentrified, unabashedly expensive, even a touch obscene, but it's pretty damn tasty, too. Actually the parking prices were posted on the Ritz-Carlton side. Makes me feel like an even bigger fool for valeting. How was the service during your dinner? As I mentioned in a tweet to you before your visit, I had horrible experiences both times I had been there for drinks. The first time, I ordered a belgian beer, which was brought out in a bottle and served in a glass in front of me. However, the server kept the glass on the table (90 degrees) and tried to pour the entire beer in quickly, and all at once. Half of the beer flowed out of the glass and what was left was 3/4 head. When someone asked why she hadn't tilted the glass, the server glared at her and said "we were told to pour it this way" and walked away. Eventually I asked for another drink because the one I had was undrinkable. 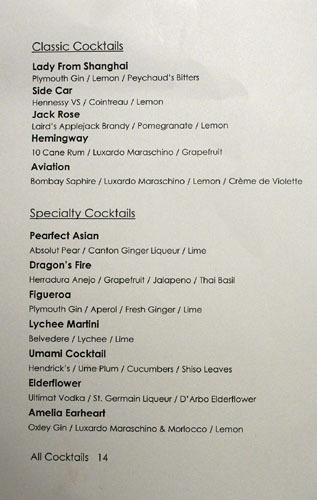 The second time I visited, my guest and I had to wait over 20 minutes after we were seated just to be handed drink menus. I then had to wait another 10 minutes for the server to come back because she hadn't given me a beer menu. Then another 15 minutes for her to return to take our order. It took almost an hour from the time we were seated until we finally got our drinks. And after the server walked away, I noticed there was a dead fly in my beer! And in typical WP24 fashion, I had to wait another 10 minutes for ANYONE to walk by so I could ask them to retrieve my server. And no, it was not busy at all. Since I live and work within a few blocks of LA Live, I would love to go to WP24 more frequently but I am extremely concerned about the service...I do not want to be embarrassed in front of guests. So if you could please share your experience in that regard, I would be very interested to hear your thoughts. Ah yes, the old "because that's how we do it" explanation. Very few things bug me more at a restaurant. Look, nobody's perfect, and almost nobody expects perfection (and those who do can never be satisfied anyway). So if you make a mistake - and spilling half of a Belgian beer is definitely a mistake - just apologize and be friendly. Why is that so hard? Great photos, Kevin. Very good work. 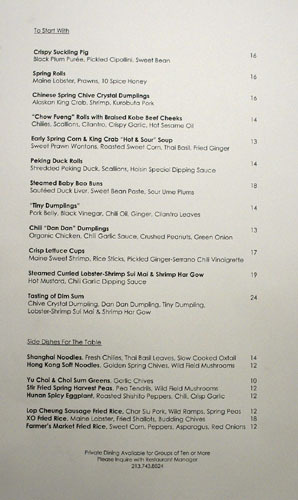 Ooh, I'd love to try the Wolfgang Puck version of Peking duck! i wonder if the misspelling of "earhart" was intentional...? 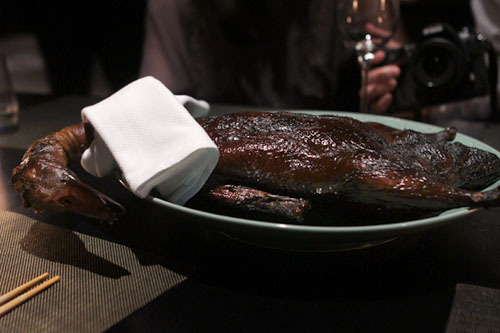 peking duck looks/sounds amazing. considering the atrocious parking situation, one might have to show up "beijing style" - on bicycle. Great post. Now I'm starving. As for the parking situation, I suggest parking at one of the LA Live lots ($10 for non-event days) or on the north side of Olympic (across the street from the JW Marriott). If you're willing to walk, the lots on Flower/Olympic (Cana/Rivera) are even cheaper. Although the space looks fantastic, I can't fathom spending so much $ on Chinese food and parking. That parking cost could last me a week here :P. Regardless, great looking pics as usual! Well it's about time I start posting on your blog. I've only been reading it forever. Chef David McIntyres food is totally different from what it was at Crescent Heights. I reviewed CH back in February of 09 and knew it wasn't going to last. Unfortunate but glad to see he's getting back into it. i can't do expensive chinese either. i grew up with fab cooks and i'd just spend the whole night thinking of my mom and pops shaking their heads. Just FYI, the menu is derived from Executive Chef Lee Hefter, David Mcintyre is the Chef de Cuisine. Great pictures by the way. Ryan: Ha, so why'd you do it then? Pressed for time? Anon: Actually, the service was pretty much on point. There were no major service issues apart from the presentation of the prawns and lobster. However, I must note that we were on the dining room side of the restaurant, which, compared to the lounge, seems much more polished in terms of service. PP: Thanks. I definitely agree about not being accountable; that beer debacle would've irked me as well. Misty: I actually enjoyed it, though you might not be such a fan if you're expecting a purely traditional preparation. Anon: Heh, I was wondering about the "Earheart" as well. 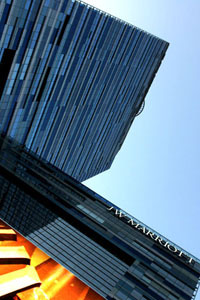 No need to go totally "Beijing" though, just park across the way at LA Live. Danny: I think we've figured out how to avoid the parking fee. 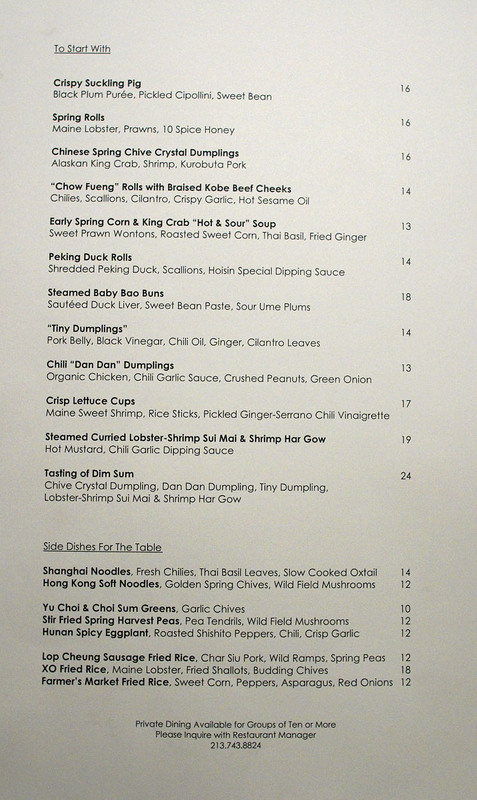 I would be curious as to your thoughts on WP24 though, since you do eat Chinese a lot more often than I do. Diana: $35, actually. 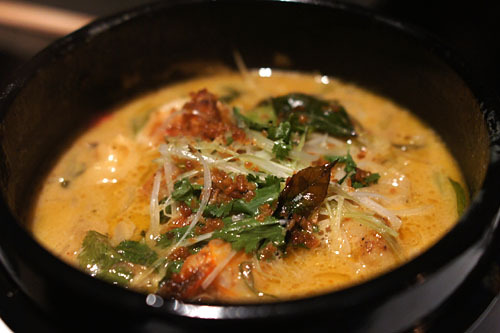 ;) Food is worth trying, and I think that it'd be interesting to compare it with what you've been having in the SGV. Bobby: I saw your review on the place. It seemed solid enough, but I guess nothing too spectacular? Do you know if McIntyre ever tried to secure another chef's position down in SD? Amy: I could never take my parents here, lol. Anon: Thanks, but are you saying that Puck himself had little or nothing to do with developing the menu? Andee: Hope it didn't disappoint then. =) Definitely do give it a shot! I don't think he did. He must have spent a good amount of money on that space, or at least his investors did. 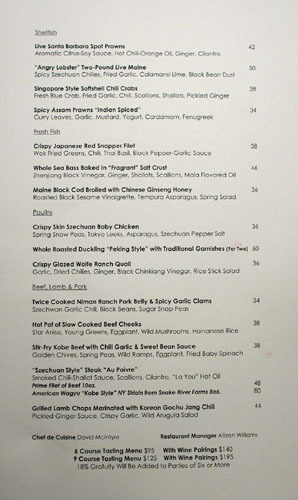 @Kevin: Yes,(Finger on point of nose) Chef Lee H. is the driving force of the menu. Except dessert, that belongs to the pastry chef of the restaurant. This isn't his first full service asian restaurant. There's "The Source" in DC and "560" in Dallas. I just happened to be in those cities when they had just opened :) Those two had more variety .... asian fusion. WP24 was more Chinese. Anon: What's McIntyre's role then? LL: Good point actually--I guess I was only thinking of LA restaurants. went there last night. They completely changed their format of the restaurant. They offer only tasting menus..
3/6/9/10 courses priced at 70/100/130/160 respectively. The difference now is the majority of the small dishes you had in the beginning are no longer listed as a course. 13. some tart style dessert. seems pricey when you just look at the menu they give you, but it ends up being tons of food. Thanks for the update Charlie--I'm curious as to what you would've received had you ordered the 10-courser! I look forward to seeing this one on your blog.